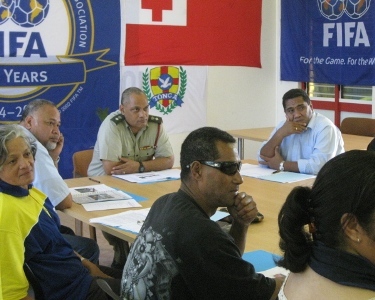 Chaired by TFA President, Lord Ve’ehala, the meeting reviewed departmental reports based on the progress of football developments in Tonga since the beginning of 2010 with a special focus on the planned inauguration of FIFA Goal 3 project, which includes a brand new dormitory block and a field scheduled for the 19 October 2010 and will coincide with Oceania Football Confederation’s FIFA retreat in Vava’u. 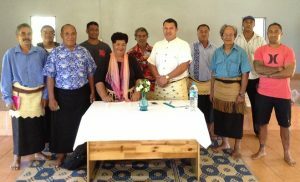 President, Lord Ve’ehala, said his committee is contented with the achievements and goals set ahead and is grateful for the General Secretary, “Ahongalu Fusmalohi’s leadership, and commitment rendered by TFA staff. “The development of football is slowly but firmly moving forward, which is very good especially with a very strong presence in the communities and schools by the Australian Government funded grassroots program, Just Play. Ngalu and his team continues achieve what we could only dream of 10 years ago including the media” Lord Ve’ehala said . TFA is currently rolling out Just Play phase two at 12 primary schools and 7 communities and although registration of participation after two weeks stand at 785 children, this figure continues to grow as entire school classes get drawn in. “I want to see TFA sustain and strengthen the growth to bring in more players to the sport and exposed them to the regional level” he added. According to the President the launching of the association’s new website, tongafootball.to is certainly a step in the right direction, providing a real insight to the reality of football here. “This is only possible through OFC’s continuous support, expertise and commitment to the region especially to Tonga, and that is the most important partnership” Lord Ve’ehala said. Football is now back on track in Éua!